-1- From either direction on TN I-81, take Exit 57B onto Hwy. 181 heading to Kingsport. -2- From Hwy 181, take Exit 4 (Old Exit 51) (Wilcox Ave.) and veer right at first red light onto John B. Dennis Hwy (Hwy 93). -3- Drive eight miles to where Bloomingdale Pike crosses John B. Dennis Hwy. After clocking eight miles on the odometer, watch for the first red light intersection AFTER White’s Foods grocery store and Pal’s restaurant (a fast-food drive-through with a giant hamburger, hot dog, French fries, and malt on its roof). -5- Go 1/2 mile (east) to the second red light on Bloomingdale Pike. -6- Revival Baptist Church is at that red light on the left, clearly marked in the brick-building suite next to Bloomingdale Floral. -1- Go EAST on Stone Drive past Eastman Rd., the John B. Dennis overpass and Lowe’s, up to the New Beason Well Rd. intersection (where Christ the King Motel is on the left). -2- Turn left onto New Beason Well Rd. and drive about two miles until the first red light. -3- Revival Baptist Church will be directly in front of you on the other side of the red light, clearly marked in the brick-building suite next to Bloomingdale Floral. -1- Go WEST on Hwy 11W (E Stone Dr.) until the New Beason Well Rd. red-light intersection (where Christ the King Motel is on the right) not far outside the eastern city limits of Kingsport. (If you see Lowe’s on the right, you have gone a little too far: it is about 13-14 miles from I-81). -2- Turn right onto New Beason Well Rd. and drive about two miles until the first red light. -1- From Hwy 23, turn east (left if southbound, right if northbound) onto Hwy 58 (Hilton Rd.). (This intersection is near the Exxon, Food City Grocery Store, and Wendy’s). -2- Go three-tenths of a mile across the bridge and around the corner to the first main road on the right (Wadlow Gap Rd. / Hwy. 224 South, which shortly becomes John B. Dennis Hwy—Hwy 93). 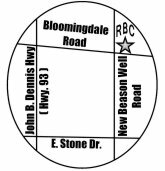 -3- Drive 4.7 miles until the very first red-light intersection, where Bloomingdale Pike crosses John B. Dennis Hwy.